For more than 35 years, Shell has led deep-water exploration and production. We developed many of the advanced technologies, processes and safety procedures that enable the safe production of oil and gas from water depths of up to 2.5 km. We produce oil and gas from the deep waters of Brazil, Malaysia, Nigeria, Norway and the USA Gulf of Mexico (GoM). We work to develop these resources responsibly and to be a good neighbour to the coastal communities closest to our operations. Around 100 km off the coast of Brazil, the Parque das Conchas project (Shell interest 50%) has a floating production, storage and offloading vessel which delivers oil to shore with tankers. By the end of 2013, all four fields were in production. Our major deep-water projects help to develop local economies through supply contracts. At Parque das Conchas, we spent more than a third of the project cost with Brazilian suppliers. The Gumusut-Kakap (Shell interest 33%) development in the South China Sea is expected to start production in 2014. With an estimated peak annual production of 135,000 barrels of oil equivalent (boe) a day, Gumusut can provide more than 20% of Malaysia’s oil supplies in the coming decade. The project features a semi-submersible production system in a region expected to need more of these structures in the future. We set up a training programme for Malaysian engineers and other skilled workers to provide technical support at Gumusut and future deep-water developments. In Nigeria, our Bonga deep-water project (Shell interest 55%) has the potential to produce more than 200,000 boe a day. It created the country’s first generation of deep-water engineers and technicians. Around 90% of Bonga’s employees are Nigerian. The project has stimulated the growth of Nigerian construction industries, which are vital to the country’s future offshore production. 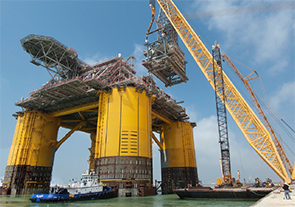 Shell has designed and installed seven deep-water platforms in the GoM since 1994. We produced 178,000 boe a day in 2013 from our facilities in GoM. The latest project, Mars B (Shell interest 72.5%), is our largest GoM platform, capable of producing 100,000 boe a day. Its four-column hull is anchored to the seabed and started up in 2014. A further 100,000 boe a day is expected from projects under construction. Our Perdido platform (Shell interest 35%), off the south Texas coast, is the world’s deepest offshore drilling and production facility operating in a depth of water of nearly 2,500 metres. Its moored structure eliminates the need to build new platforms, helping to minimise our environmental footprint.